Have you taken all the excitement out of Christmas? "If you know the movie is scary, why watch it?" we questioned our teens who had nightmares afterward. "You don't understand! It's fun!" they said. Many adults have long given up the notion of being frightened as a way of entertainment. We have vowed never to get on any rides in the amusement park that will raise our blood pressure or churn our stomachs. Unfortunately, many of us have also mellowed spiritually. We prefer not to be emotional or passionate about any thing. Even Christmas has become just another holiday tradition — mildly fun, but hardly exciting. For the shepherds, that very first Christmas was an action-packed thriller, filled with all sorts of fear factors. Would they still live after witnessing the angels and the glory of God? Humans were not normally allowed into the presence of God's glory! How would the Messiah's family receive them? After all, they were only lowly shepherds! What would others think of them and their story of angels? Their story hardly seemed believable. Admittedly, for many of us the Christmas story has become predictably dull. Yes, we know the where and how of Jesus' birth, we know the plot but long have forgotten the purpose of the Nativity, and many even contend that we cannot know the date of the Lord's birth with certainty so why even bother with celebrating it on a certain day? For us, there are no more fear factors — only tradition, routine, and detached discussion. Has the Christmas story become dull? What would make this Christmas a little bit more thrilling like that holy night the shepherds first met God's Messiah and their Savior? 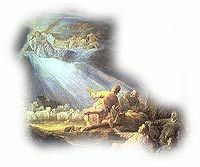 What would open our hearts to the Lord's glory like the shepherds experienced the heavenly host in all of their heavenly glory? What risk are we willing to take at Christmas to share in the joy of Jesus' birth like the shepherds? Maybe we've forgotten that it's fun ... and thrilling ... and glorious ... joyous ... and holy! "Christmas Fear Factor?" by Jeff Lee is licensed under a Creative Commons License. Heartlight encourages you to share this material with others in church bulletins, personal emails, and other non-commercial uses. Please see our Usage Guidelines for more information.